Although summer hasn’t yet officially arrived, things are starting to really heat up outside (or get cold if you’re in the southern hemisphere); now is the perfect time to stay inside and sew! Here are a few ideas for summer sewing and quilting projects. 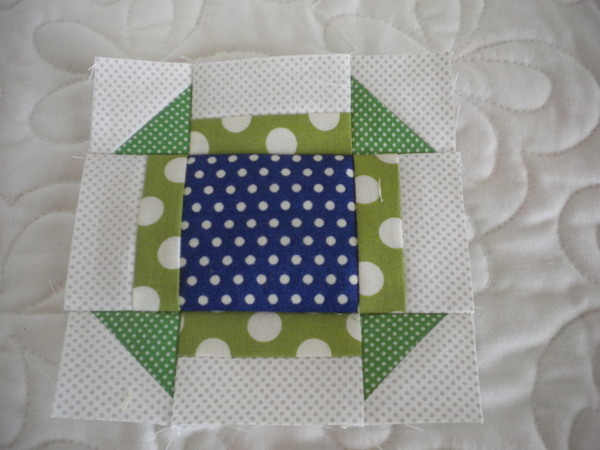 If you haven’t yet tried one of the fun new mini patterns available, how about making a mini quilt this summer? 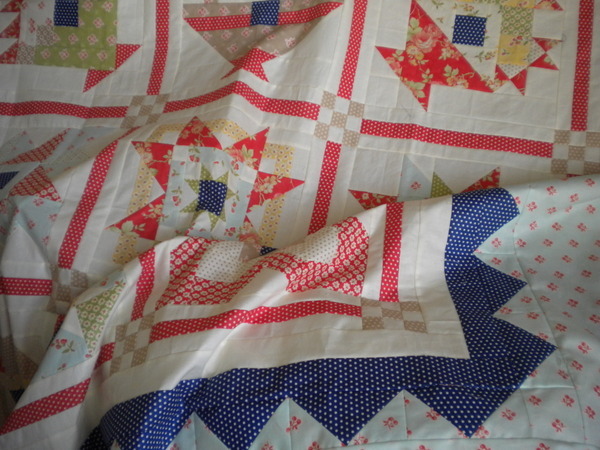 Mini quilts generally use charm packs, Moda Candy, and other small cuts of fabric, and they can be put together relatively quickly. Mini quilts are the perfect projects to practice using new color combinations and also perfect for mixing various collections. These small quilts are perfect for practicing your machine quilting skills, too. Summer is the perfect time to get caught up on some of those works in progress hiding in drawers and closets! Why not make a list of what you need to work on and try to get a few things finished up over the summer? Summer is also a terrific time for getting caught up on Block of the Month programs and for binding quilts that just need that last step to be finished! It seems there are always several “quilt along” activities to choose from in the summer. The Nested Churn Dash Quilt Along is in full swing right now…and there are several others going on as well. Participating in a quilt along can be a great way to get inspiration from other quilters, play with new fabric combinations, and work on blocks with flexible deadlines. Get ready for the 4th of July by sprucing up your table with seasonal place mats. 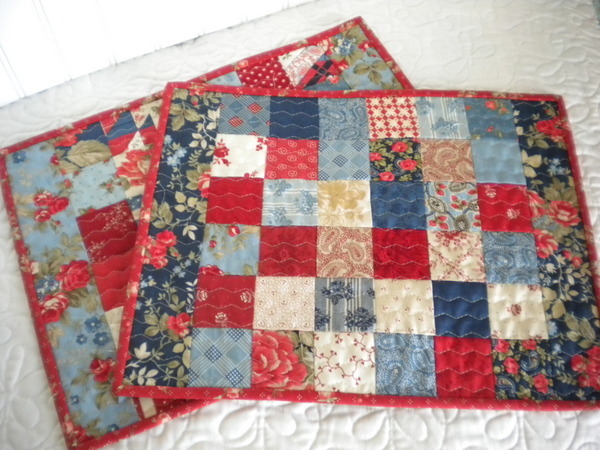 You can also make holiday table runners, pillows, and, of course, don’t forget to bring out all of your red white and blue quilts to add to your decor this summer. Summer is a great time to take your machine in for a professional cleaning to make sure everything is running smoothly. 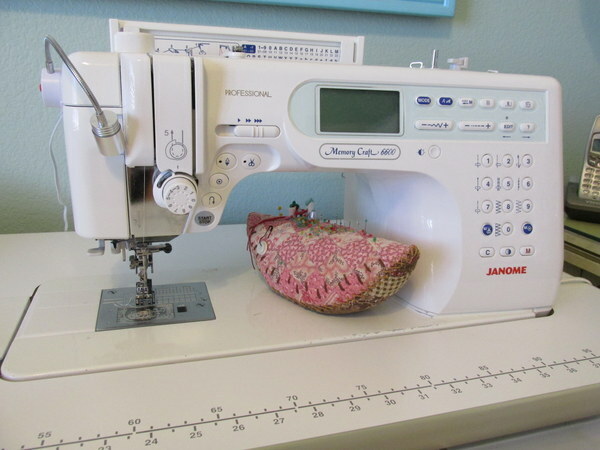 Dropping of your machine right before you leave town for a summer vacations is a good idea–your machine will be running like new when you get home, and you won’t have to miss not sewing! Summer is the perfect time to work on organizing projects in the sewing room. Whether your summer organizing projects is big or small, take a little time to make a list or two of things you might want to tidy up. If you’re running low on any of your favorite notions, this can be a great time to make note of that and start a shopping list for the next time you’re at your local quilt shop. Summer can be the perfect season to try something new, get caught up on projects, make holiday decor, and get organized in the sewing room. Take a little time to plan some fun summer projects today. What summer project will you work on first? The mini Blossom by Fig Tree has my heart. Am loving the mini-lisciousness going on right now! 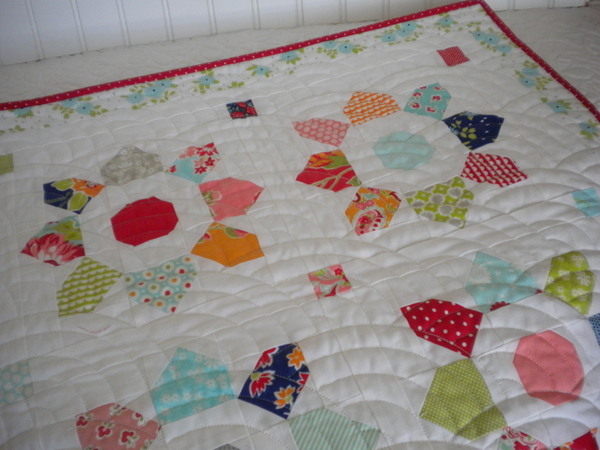 Love the cheerful mini quilt! 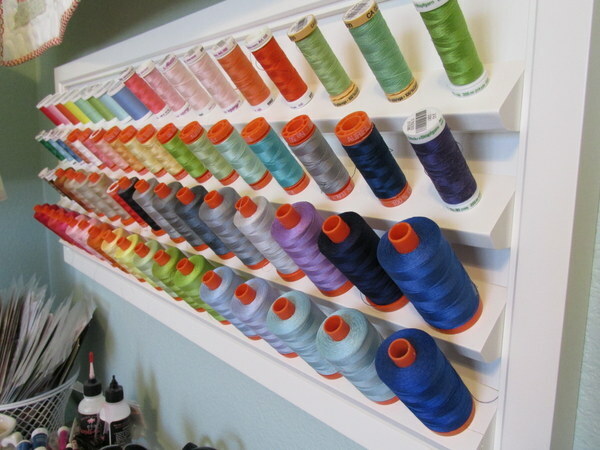 The thread rack is very nice—is there a source for it? ?